Working with ceramic materials has become central to my life ever since I discovered the magic of transforming a lump of ceramic material into a wondrous piece of a work of art which is both aesthetic and useful. Through this work I have a wonderful chance to express myself and to derive enormous satisfaction especially when I see my work decorating and adding beauty and atmosphere in so many places. Each piece of my work is hand sculptured, without the use of molds and is therefore unique, with the emphasis on the highest quality possible up to and including the finishing touches. 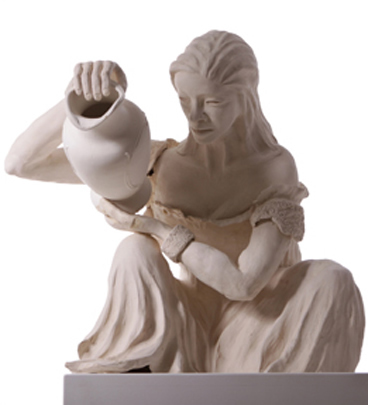 On my website you can find a variety of decorative sculptures ceramic sculptures with a biblical theme sculptures as illuminating elements and sculptures which can be hung from anywhere in the house. I invite you to " walk" through my site and enjoy a selection of my works. Customized orders for any items in any categories can be ordered for a sculpture which will result in a combined work of art which will reflect your personal taste.